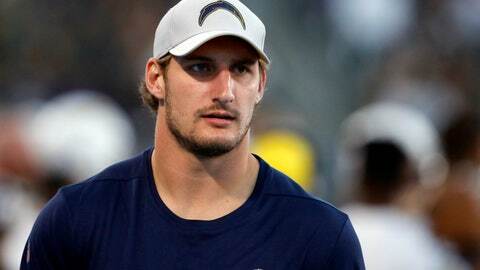 COSTA MESA, Calif. (AP) — Joey Bosa could possibly make his season debut Sunday. The Los Angeles Chargers defensive end, who has been out with a foot injury, practiced Wednesday. Coach Anthony Lynn said he was excited to see Bosa practicing with his teammates for the first time since Sept. 5. Bosa did individual drills during the portion of practice open to reporters and was listed as limited on the team’s practice report. Lynn has continued to stress caution about when Bosa could return, but acknowledged he could play against Denver depending on how well the third-year lineman does in individual and team drills. “He hasn’t played football in 13-14 weeks, whatever it is. So we have to be careful putting him back in,” Lynn said. Bosa first injured his foot during training camp, which caused him to miss the preseason. He reinjured it during practice leading up to the opener against Kansas City. Bosa said two weeks ago that he should not have rushed in trying to get back for the first week. Isaac Rochell, who started three games at defensive end, said Bosa has been a big presence in team meetings even though he hasn’t played. “He’s super engaged. He’s been locked in at all times. He has been going through scouting reports and the game plan,” Rochell said. The Chargers are 7-2 and have won six straight despite Bosa’s absence. Los Angeles’ pass rush struggled early in the season, but has 15 sacks in the past four games. Bosa has 23 sacks in two seasons, including an NFL-record 19 in his first 20 games. Bosa’s return this week could help bolster a unit that is down two starters at linebacker after Denzel Perryman was placed on injured reserve due to a knee injury. Denver is 3-6 but is ranked 11th in the league in offense.